Nitrogen (N) deficiency symptoms: Symptoms first show up in older leaves as pale green to yellow colouring, and sometimes purpling. Tissue analysis can confirm these observations, but tissue analysis is not an exact science. Sampling error can be a problem. Many labs offer tissue samples, so check with the lab for proper sampling procedures. Turn around time is another hurdle. Growers should sample as early as possible to get results in time to take action. Canola Encyclopedia section on N deficiency. Yellow lower leaves can be a sign of nitrogen deficiency. Sulphur (S) deficiency symptoms: Sulphur (S) uptake is slow and steady and therefore deficiency symptoms rarely show up until later in the season, often not until flowering. 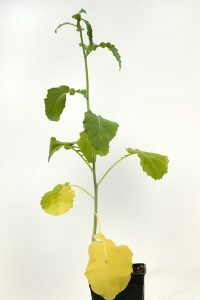 With sulphur deficiency, yellowing and leaf cupping tend to occur on new leaves first. Purpling of leaf edges can show up when deficiency is fairly severe. 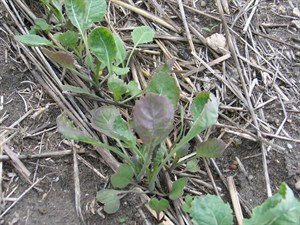 In fields short of sulphur, crops can usually find enough to get past the early rosette stage without visible symptoms. Canola Encyclopedia section on S deficiency. Early-season sulphur deficiency symptoms include cupping and purpling of leaves, but soil tests and a knowledge of cropping history will help to confirm. Phosphorus (P) deficiency symptoms: Phosphorus deficiencies look like delayed maturity and spindly plants. Visual symptoms of plant P deficiency are generally neither definitive nor pronounced enough in the field to be very diagnostic. This “hidden hunger” goes unnoticed or mistaken for other stresses unless a direct comparison of growth in adjacent P-fertilized and non-treated areas within the field is possible. Canola Encyclopedia section on P deficiency. 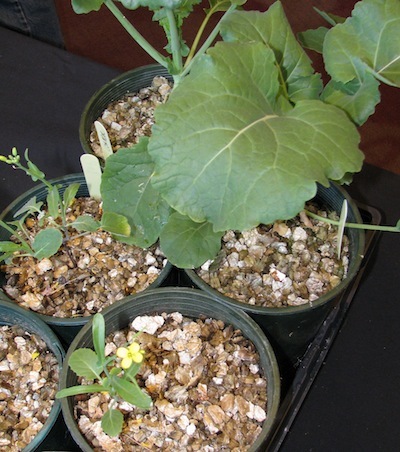 These plants were seeded the same day in a greenhouse and fed hydroponically to demonstrate extreme P deficiency. The potting mix has no nutrient value. The large plant received required levels of P. The tiny plants in front received no P.
Potassium (K) deficiency symptoms: Potassium deficiencies look like a yellowish brown “scorched” look at leaf edges. Potassium is mobile, so plants will move the nutrient from bottom leaves to top leaves, so bottom leaves will yellow off first. Potassium deficiency symptoms in canola are rather non-distinct and can be easily confused with other problems. 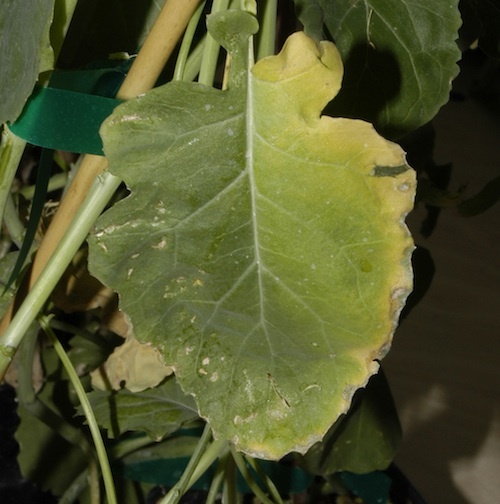 Canola Encyclopedia section on K deficiency. Yellowing at leaf margins is typical of potassium deficiency. Are those symptoms really related to nutrient deficiency? Similar symptoms can have many causes, as the June 13, 2018 quiz demonstrates. Also read Diagnosing nutrient deficiency. 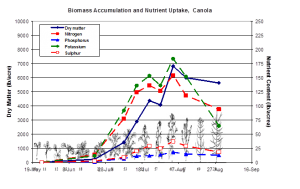 When considering the possibility of nutrient deficiency, think about your fertilizer rates for 2018 and historically, your soil test results and crop needs and uptake timing. 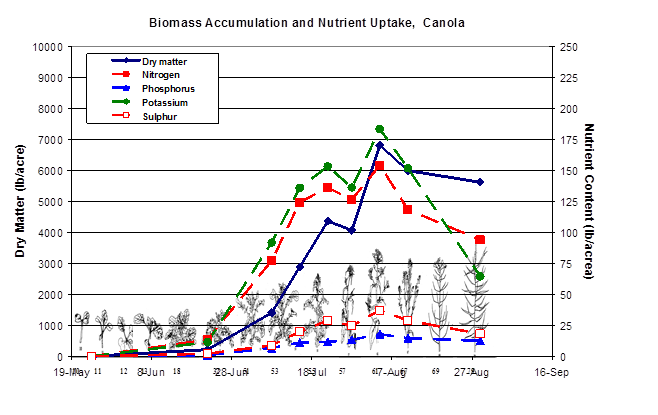 Canola nutrient uptake and removal, in lb./bu.